Independent whisky bottler and blender Douglas Laing from Glasgow added a new blended (or vatted) malt to their core range including Big Peat, Scallywag and Timorous Beastie. Every expression bears the typical characteristics of a certain Scotch whisky region. Everything-that-is-good-at-Islay-boasting Big Peat remains the flagship of the brand. In recent years Fred Laing and company added Scallywag, a Speyside blend, and Timorous Beastie from the Highlands to the family. At the start of 2015, Big Peat may face some serious competition from within. Meet Rock Oyster, another small batch bottling created using the finest maritime malts from Islay, Jura, Orkney and Arran. A few distilleries were revealed during a Tweet Tasting some two weeks ago. 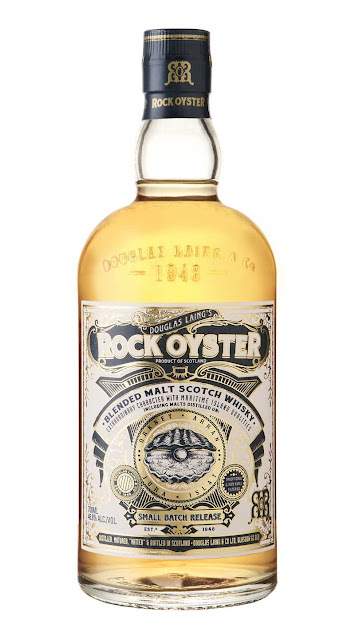 We are now fairly certain that Rock Oyster contains Bunnahabhain (Islay), Arran (Isle of Arran), Highland Park (Orkney), Talisker (Skye) and Jura (Isle of Jura). Get your oyster knife and a handkerchief. We're going to pry open some oysters! Colour: Rock Oyster has a pale yellow colour. Douglas Laing takes pride in offering whiskies without any additional colouring nor chill-filtering. The whisky shows thin and fast legs after swirling. Nose: The salty sea air clearly hints at its maritime origins. Salted lemon confit and a faint hint of nam pla (salty Thai fish sauce) accentuate this even more. The whisky shows a malty character with light smoke and something sweet. I'm thinking of sugared butter. The nose also offers some matured cheese and the accompanying ammonia odour (in a pleasant way, let's get that straight) and some wood-stain. This is a flavour I always associated with the 10yo Talisker. M&M's with salted peanuts and something I could only describe as an ashtray washed out with seawater. With water, I'm getting some minty notes, again M&M's and chopped chilli peppers. Taste: Salt and pepper are the perfect company for this oyster. The peat smoke is more prominent now. Citrus and honey liven up the palate and cigarette ashes are still floating around in the mouth. Just a wee drop of water brings up even more peat smoke and diminishes the sweet flavours. A final burst of salted peanuts and ash. Finish: A surprisingly sweet aftertaste with a leftover from that lemon confit. Aromatic wood, pepper and the always returning cigarettes. Douglas Laing hits the mark again with Rock Oyster. I initially had some worries it would be inside competition for Big Peat (BTW: I did a review on that Friendly cigar smoking and coffee slurping beardy fisherman last year). Luckily it proves to be a totally different dram. Just like the other blended malts the price tag stays just under the €50 or £39.00. A highly recommended whisky. 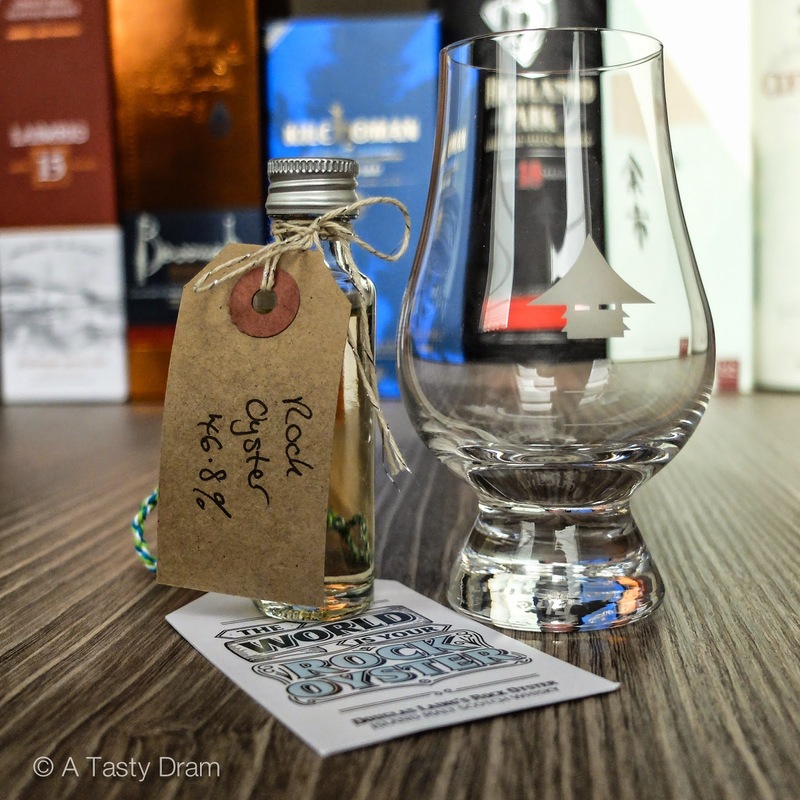 A sample of Rock Oyster was provided by Douglas Laing for the #RockOyster Tweet Tasting put up by The Whisky Wire. Packaging and artwork: Pocket Rocket Creative and Anna Koska.